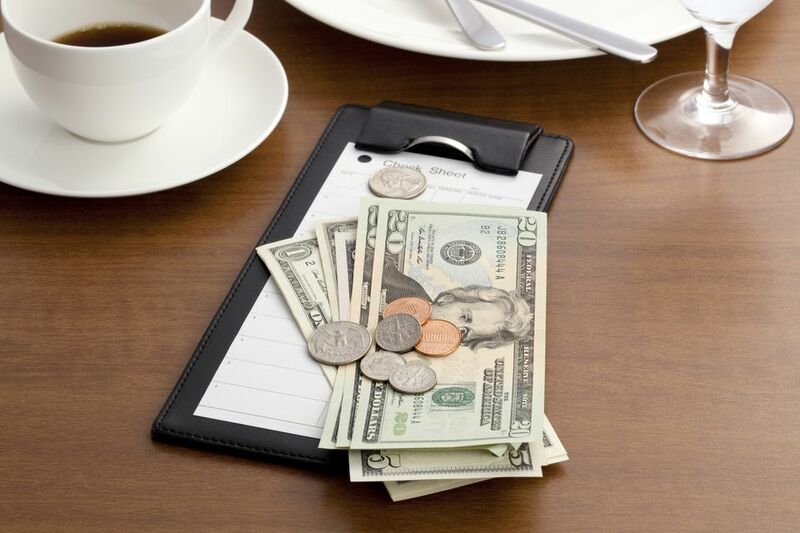 Tipping may not be a universal expectation, but it is common in American restaurants. Many servers in America are paid less than the minimum hourly wage, depending on local laws where they are working, and their tips provide a significant part of their income. There's also a long history associated with tipping in the United States. If you've gotten good service, leave the server an appropriate tip for a job well done. But many diners aren't quite sure about tipping rules and etiquette and how to actually calculate a tip. In the United States, the average tip at a restaurant is generally considered to be between 15 to 20 percent of the bill. However, a 2016 Zagat survey found that the average tip in American restaurants was 18.9 percent. (This was the latest information available as of January 2018.) Recently a few restaurants, especially on the East and West coasts, have been doing away with tips and calling themselves tip-inclusive restaurants. These restaurants raise the hourly pay of servers to cover for their loss of tips, and you are not expected to leave a tip. But by far the majority of restaurants are not tip-inclusive, and you should leave a tip for the server unless you are certain it is a tip-inclusive restaurant (usually there will be a note on the menu or the check). But the United States is not the norm. In Italy, for example, people either do not tip or tip very little, especially since most osterias and trattorias will include an il servizio (or service) charge. And in Ireland tipping of around 10 percent is recommended at Irish pubs and restaurants. Once you've decided on the percentage tip you want to leave, calculate your tip based on the total before tax. Also check and see if there's a service charge, in which case you should not leave any additional tip (unless you had an exceptional experience with the staff). If you've ordered a lot of alcoholic drinks, you might want to calculate your tip on your food separately from your drinks. You can tip at a lower rate for drinks, usually at around 10 to 15 percent, rather than the 15 to 20 percent that is usual for food. If you've used any coupons or discounts, calculate your tip based on how much you would have paid without those discounts. If you have special requests or requirements, such as a large party, young children who have made a mess, or special dietary restrictions, it's considerate and fair to leave a slightly higher tip. Even if the owner of the restaurant serves you, you should tip him at least 15 percent. It's been argued that it is not necessary to tip owners because if the owner is your server, you aren't depriving the owner of his pay in the same way you would deprive a server. However, etiquette requires that you tip the owner because the owner is providing you with a service, and you are responding to that service by providing him with a bit of extra compensation. If you are tipping 15 percent, multiply the pre-tax amount by 10 percent and then add half of that amount. So, if you have a bill for $27.50, 10 percent is $2.75, and half of that amount is roughly $1.38. The total tip would be $4.13, and a $4.20 tip would be perfectly acceptable. Another easy method is to look at your sales tax amount. If your sales tax is roughly 8 percent, then double that amount and your server will get a 15- to 16-percent tip. A 20 percent tip is simple to calculate. Just figure out 10 percent of the bill and multiply by two. Do I Need to Tip at Restaurants in Mexico?